from Dr. Jared Hanson N.D., L.Ac. 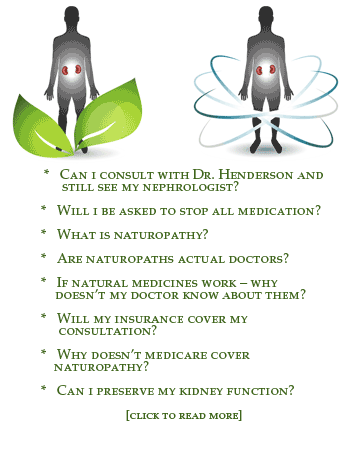 Dr. Henderson is interviewed by New York City naturopathic doctor, Jared Hanson. Q: This is the first of what I hope will be many in a series of interviews with experts in natural or alternative medicine. Dr. Jenna Henderson N.D. is a naturopathic physician and an expert in the holistic approach to kidney health. Information on natural approaches to kidney disease is incredibly valuable and unfortunately it can be hard to find. What role do you think natural medicine should play in the treatment of kidney disease? Dr. Jenna C. Henderson: Having seen natural medicine and mainstream medicine close up in dealing with kidney disease, I think there is a lot the natural medicine can offer patients that they can’t find anywhere else. For those in an early stage of kidney disease, we can bring their bodies back into balance. And for those in a later stage with severely compromised kidneys, we can keep their kidney function going with a maintenance regimen. Natural medicine has the tools to control blood pressure, inflammation and cholesterol and improve kidney function– and all of it without the dangerous side effects of prescription drugs. Q: So let’s look at someone in an early stage, if they’ve just been diagnosed with kidney disease. Are there specific steps that you would recommend? Dr. Jenna C. Henderson: In the early stage of kidney disease there is some damage to the nephrons or filtering units, but the kidneys are still able to clean the blood thoroughly. As long as the creatinine is under 1.3 your function is still pretty good. First get to the bottom of what’s causing the kidney damage. If it’s diabetes, get it under control. If it’s hypertension, control that. If it is one of the inflammatory kidney diseases such as IgA nephropathy, Focal Sclerosis or Minimal Changec– bring down the inflammation. For the Type 2 diabetic change their lifestyle and lose weight. The addition of some supplements for glycemic control can help too. With high blood pressure it is important to take medications on a regular basis. Even one skipped dose can be damaging. Of course, I prefer a natural approach with stress management and botanicals. The prescription drugs can cause erectile dysfunction in males and a loss of desire in females. Many of them will weaken the heart over time. When the kidneys are inflamed there is a loss of protein in the urine. The urine looks foamy when this happens. It is easy to know if what you’re doing to reduce inflammation is working because the urine will be less visibly foamy. Adopt a diet that has many fresh fruits and vegetables and avoid saturated fat and fried foods. Natural anti-inflammatories will make a world of difference – quercetin, bromelain and fish oil will make the urine visibly less foamy. And from the Eastern perspective do the things that preserve kidney chi and bring you into balance. Get plenty of sleep – at night. This is especially important but hard as many kidney patients deal with insomnia and they are awake all night and sleep during the day. Acupuncture can help and sunlight during the morning hours can reset the body’s internal time clock. Q: How do the recommendations change for those with more advanced disease, such as patients who are already on dialysis? Dr. Jenna C. Henderson: Well it’s my hope to prevent their going on dialysis. With advanced disease I would add on to their protocol with high dose coenzyme Q10 and l-carnitine. When the kidneys have sustained damage there is a loss of functioning nephrons to filter the blood. That means that the remaining nephrons have to work harder to keep up with the body’s demands. That is called a state of hyper-filtration, when the kidneys are overworked. That is when they are most vulnerable to fail. The purpose of the coenzyme Q10 and l-carnitine is to supply energy on the cellular level to the nephrons. This will support the remaining nephrons in keeping up with the body’s demands. This approach can keep dialysis at bay for a long time, sometimes indefinitely. If you have had diabetes, high blood pressure or nephritis for any length of time, you can bet there has been damage and your kidneys are in a state of hyper-filtration. Even if your creatinine is normal. Your kidneys are working harder and harder to keep the blood clean. When the creatinine jumps up it happens suddenly. It’s like your gas tank going from full to zero all at once, but that is how chronic kidney failure happens. It is a chronic situation that all of a sudden becomes a crisis. When you’re on dialysis it seems like the end of the world but there are many things you can do to keep your body in optimum shape. Keep up the coenzyme Q10 and add solid hawthorne extract to protect the heart. People don’t die from uremic poisoning in this day and age, but they do die from heart failure as a complication of the kidney disease process. Also, green tea to lower the BUN and bioflavonoids to strengthen the blood vessels. If you do hemodialysis it is very hard on the blood vessels. The bioflavonoids are very important. Also eat lots of berries – safe for the dialysis diet and rich in bioflavonoids. The dialysis diet is very restrictive, but it is important to stick with it. That means that there are a lot of nutrients in fresh fruits and vegetables that are off limits to a dialysis patient because they are high in potassium. When the kidneys fail they no longer filter out potassium and elevated levels could stop the heart. Don’t cheat on this diet, but try to make up the nutrients you are missing with supplements. Q: When you say dialysis can be kept at bay, do you feel that there are people who are put on dialysis too early when a natural approach would be more appropriate? In your opinion, is there a possibility to come off dialysis in certain patients? Dr. Jenna C. Henderson: No. When it’s time to go on dialysis, don’t fight it. There are some people who will use extreme protein deprivation and can delay it to some extent, but when it’s time to get on the machine, do it. There are no natural approaches that I’m aware of, and I’ve been looking at this for 15 years, that can help at that point. When the kidney function is gone or you’re left with residual function which is not enough to sustain life, it is time to get on the machine. At that point we look at natural remedies for maintaining optimum wellness. Q: Do you have any preventative advice for the general public for protecting their kidney function? Are there any hidden threats to kidney function that you think people need to be more aware of? Dr. Jenna C. Henderson: The most common reason people experience kidney failure is diabetes and second is high blood pressure. Early screening and consistent care can be helpful in most situations. As far as kidney diseases that involve the immune system I believe that sunlight and Vitamin D are very important. Vitamin D plays a critical role in the function of the immune system. And these diseases are more prevalent in places with less sunlight exposure. African Americans have these kidney problems frequently but Africans generally do not. In Northern Europe, these conditions are relatively common but in Australia it is much less so. It is a similar worldwide distribution to Multiple sclerosis – another autoimmune disease, being common where there is less sunlight. Since people in the last century have moved indoors and no longer work outside we have seen an explosion of autoimmune diseases. So one of the best things you can do is get your kids away from the computer and doing something physical outside.